Today we mourn a fallen competitor. 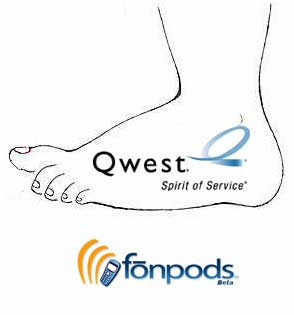 As apparent fallout from the Qwest suit against Voice 2.0 companies that were using the CLEC loophole as a biz model, the Fonpods site is now controlled (i.e. shut down) by Qwest. I despise this type of legal bullying. It's one thing if a lone crazy person threatens a frivolous lawsuit; you can either fight those people, pay off their blackmail, or just ignore them. It's another thing if a multibillion dollar corporation with hundreds of lawyers on retainer actually sues you. Now I don't know if Qwest's claim was frivolous or not, but at the end of the day, it's moot.